Still from Die reine Notwendigkeit/The pure necessity, 2016. Single channel video, HD animation, color, stereo sound, 60 minutes, looped. © David Claerbout, Courtesy of the artist and Sean Kelly, NY. Sean Kelly, New York, and Esther Schipper, Berlin, are delighted to present Die reine Notwendigkeit/The pure necessity (color), 2016, a new film by internationally acclaimed artist David Claerbout at Art Unlimited. 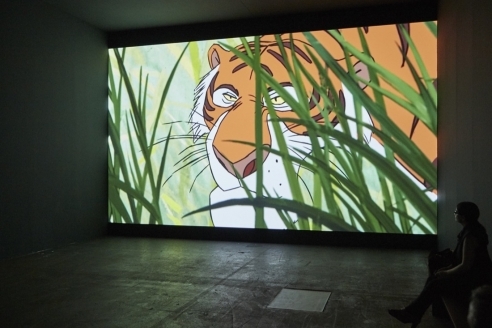 For The pure necessity, David Claerbout and a team of professional artists redrew the frames of the original 1967 classic animated film The Jungle Book and then assembled them to create an entirely new, hour-long film. Instead of a sentimental and funny story about singing and dancing jungle animals befriending an abandoned boy in the middle of the jungle, Claerbout’s film removes the young human protagonist and dispenses with the anthropomorphism of the animals. Devoid of narrative and comic antics, the animals move through the jungle in a more natural manner.